I made sugar-free cole slaw for our family reunion this weekend. 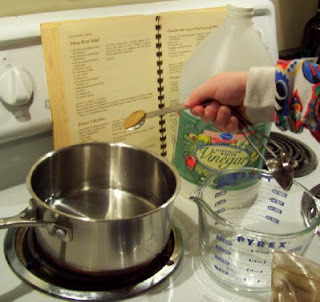 I prefer vinegar based slaws for picnics, to reduce the chance of spoilage. At $1.29 a head, cabbage is another frugal standby. I adapted this tart-and-tangy version from The Nashville Cookbook (1976). One large head of cabbage makes at least 8 servings. 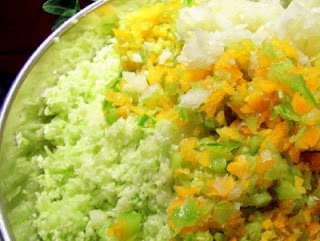 Doubled, the two-cabbage version filled my largest mixing bowl to the brim. Invest in a food processor if you cook from scratch often. My used-once Kitchenaid cost $20 at a yard sale. Fresh chopped cole slaw tastes better and costs less. 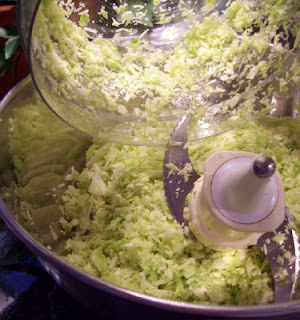 If I'm making a creamy slaw, I use the shredding disc for thin ribbons of cabbage. For vinegar slaws, I prefer a thin dice. Cut one head cabbage into quarters. "Pulse" to an even chopped texture in small batches. Pour the still-hot dressing over the cabbage and stir. Refrigerate for several hours. 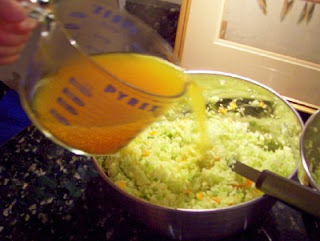 My doubled batch needed 2 bowls for adequate mixing, but the cole slaw condensed overnight. The turmeric gives this slaw a yellow color. I love coleslaw! My favorite version is from The Mitford Reader Cookbook. I think it's called "Ray's Coleslaw." It's a lovely mix of mayo and cider vinegar and just a little bit of sugar. And it's a great topping for fish tacos! I'll second that thought. I LOVE coleslaw, too. You've made me hungry for it, so I'll have to make some tomorrow! But I don't have a food processor, so it will mean lots of chopping! !